After Tarawih prayer, the souks of the old city would be buzzing with people, selling all types of desserts, sweets and savoury snacks. Everyone knows everyone in Falasteen; a walk in the market is like visiting the homes of all your relatives, neighbours and friends (everyone you know) at once. The worshipers and their teachers, the shoppers, the merchants, the running children, the chatty adults, and the strollers – on which snacks are sold – are all being squeezed through the ancient narrow alleys as “Kaek” & “Baraze'” are being shouted out to wet your appetite, not just for the decadent sesame-coated bread rings (Kaek) or its sweet counterpart the (Baraze’ cookies), but for life! This ancient city, perked right in the middle of the Middle East, is so alive and buzzing that it blows in you a whiff of its own soul, rubbing on you in every which way and direction that you no longer distinguish your self from hers. This is after all, Jerusalem – The land on which heaven met earth and continues to dialogue. One of the most common Ramadan Traditions everywhere is praying at mosques. During the Holy month all Muslims prefer praying in Mosques, especially Maghrib صلاة المغرب (sunset) and Tarawih صلاة التراويح (evening) prayers. In Falasteen فلسطين (Palestine) it is no different, people prefer praying in the mosque, however, over there people are lucky as they get to pray in Al Aqsa Mosque المسجد الأقصى, one of the holiest sites in Muslim Religion, as it used to be Muslims’ first Qiblah القبلة الأولى. In Ramadan, most Muslims set to read the whole Quran (Khitma ختم القرآن) within the month, as the Quran is meant to purify the soul as well as teach people the right religious practice. Tarawih prayers are special evening prayers, performed during the Holy month, which are longer than the usual evening prayer as during Tarwaih the Quran is read at length – aiming to read it in full, if possible more than once – during the month. Therefore, most people would carry out Tarawih, and preferably at the mosque. 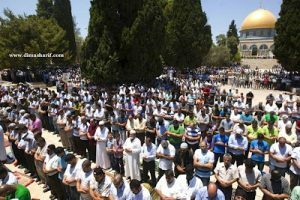 In Al Quds القدس (Jerusalem), where Al Aqsa Mosque is, most people would gather in the mosque’s yard before sunset prayer, and would break their fast with dates, water and other Ramadan drinks, before performing Maghrib prayer there. They would then have their Iftar meal in the mosque’s yard, enjoying the outdoors in the company of the Mosques beautiful surroundings. Therefore, many organisations as well as individuals will organise communal Iftars at Al Aqsa Mosque, where they get to feed many fasting people (Itam Saem إطعام صائم) which is considered to be a practice highly rewarded by God. These communal Iftars are not only meant to feed those in need, but are also for anyone present, as many people work in Jerusalem but don’t live there, and some would not make it back home in time for Iftar, so they too can enjoy these Iftar meals. Other than the organised communal Iftars, it is very common for people to take their Iftar meal, in picnic style and have it at the Mosque’s yard. In Falasteen street food is just as good as home food, and while over there people gather and break fast with the family (extended family, neighbours and friends included in the term, ie the whole country) over a home cooked meal, many items such as pickles, olives, Msabaha, fool, hummus… and beverages… would be bought from the market and brought home to accompany the home cooked delights for Iftar. After Tarawih, the whole country it seems is out and about enjoying the flavours of the Palestinian markets and its old souks. After Iftar and by the evening prayer time, people would then perform Tarawih after which the old souks in all Palestinian cities would be buzzing with people, selling all types of desserts and sweets such as Knafeh كنافة, Kullaj كلاج (Palestinian desserts, the specialty of the city of Nablus نابلس) Ba’lawa بقلاوة, Warbat وربات, Shueibyat شعيبيات (all of which are made using filo dough and filled with nuts or cheese, then drenched in sugar syrup), Halawet il Jiben حلاوة الجبن (a dessert made from cheese, filled with Arabic style clotted cream and drenched with sugar syrup. Best had in the city of Akka عكا as they are known for their specialty Akkawi cheese جبنة عكاوية), Boza Rukab بوظة ركب (A Palestinian ice cream, the specialty of the city of Ramallah رام الله), as well as Kaek bitamer كعك بالتمر (sweet bread rings filled with dates, the specialty of Hebron الخليل, Gaza غزة and Jerusalem القدس) and Baraze’ برازيء (sesame coated sweet cookies with Pistachio, the specialty of Jerusalem)… just to name a few. Many people would go out after Iftar. The coffee shops are a very common choice, where people go for coffee, shisha and play Tawla طاولة زهر (backgammon), or cards and other games. 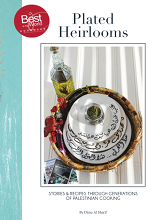 However, the most celebrated form of entertainment in Palestine is simply hanging out in its public places like by the sea, the gardens, the parks, the souks and even the streets; taking in its beauty. It seems everyone is out after Iftar and the country is just buzzing and very crowded. People would just go out and sit anywhere with a picnic, they would have their children, at times friends and neighbours with them. 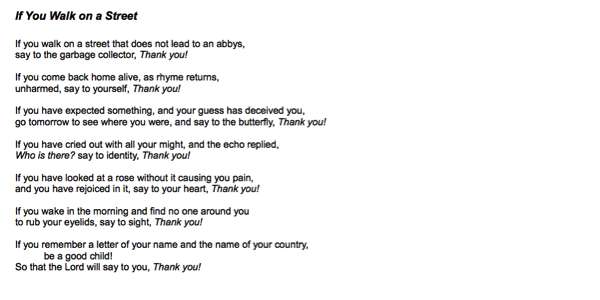 With that said, in Palestine, like in other countries many people like to host Iftars and Suhoors, and exchange home visits too. TV Dramas are very popular during Ramadan. Most people would have a few dramas that they watch and anticipatingly wait for (I remember my grandmas TV time, when no one would utter a word so not to distract her, always accompanied with a table of delicious snacks and fruits). This is one very popular after Iftar entertainment, however, it is more for the older generation as the young prefer hanging out. the stuffing includes minced meat and meat pieces are cooked along with the stuffed vegetables and the dish is served hot as a main course), Mahashi Bil Bandoora or Laban محاشي باللبن أو البندورة (Stuffed vegetables in tomato sauce or yogurt sauce), Maqloobeh مقلوبة (Upside down pot of rice, meat and vegetables in many variations), Qidreh قدرة (A dish of caramelised onions, meat, rice and whole hummus), Musakhan مسخن Palestine’s best loved dish… that is just to name some.What the Palestinians Eat for Iftar. Palestinian cuisine is huge and filled with varieties. Most of the cuisine’s foods are elaborate and festive, so whatever is eaten during the year is fit enough to feed a king, therefore fit enough for a Ramadan Iftar. Besides Qatayef, there is not much that is Ramadan specific, however during the Holy month dishes such as fattehs (Layered platters of bread/rice, meats and vegetables) are had more often than during the rest of the year. All the varieties of stuffed vegetables and rolled leaves are cooked in concentration during the month. Also soups, which are not a part of everyone’s daily diet are consumed daily in Ramadan. 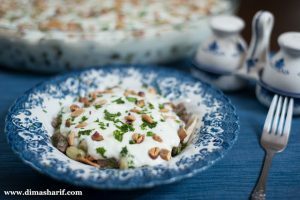 If you are not full eating delights from the markets, and if you are home in time for Suhoor then the meal would include what the Palestinians call Hawader حواضر (ready foods) and Nawashef نواشف (sauceless foods). 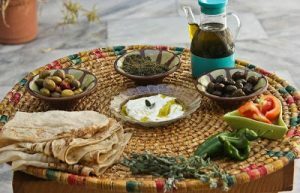 Hawader include zaatar, labneh, olives, grilled Nabulsi cheese, manaqeesh, maqdoos (nut-stuffed eggplants that are pickled in olive oil), hummus, falafel…. While Nawashif are leftovers from making the food such as leftover fried eggplants or cauliflower from making maqloobeh. These would be sprinkled with cumin or sumac and a squeeze of lemon and had with bread. Another example is the flesh from coring Kusa when making the stuffed kusa, which is then stir fried with olive oil, garlic and cumin, also had with bread… Fatteh الفتة is another example for using these leftover ingredients to create a separate and equally delicious dish. 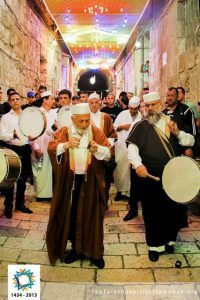 Ramadan is hugely celebrated in Palestine, and has a unique spirit there. 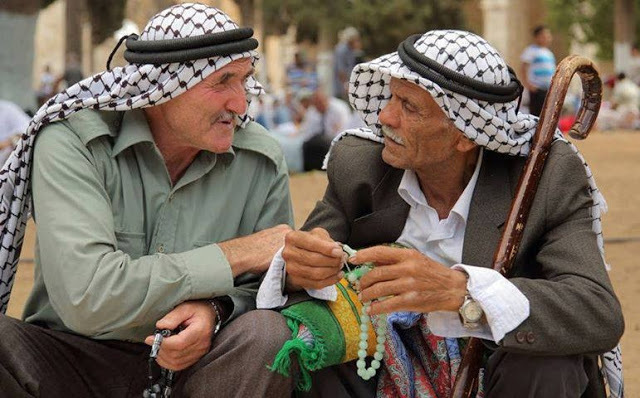 From the spirituality of practice, communal bonding, to the celebration of Iftar and the all-night activities to breaking fast with the family – which in the Palestinian sense includes all Palestinians (ie the whole country) – to exchanging visits and picnics at the Mosques’ yards… Palestine is a country whose people appreciate life and celebrate it together as a family. Despite Ramadan being a Muslim celebration, in Palestine all people are one. The Christians too celebrate with their Muslim neighbours and friends. It is very common to be invited to your Christian friend’s/neighbour’s home for Iftar during Ramadan and vice versa. The same applies to exchanging visits and celebrating Christian festivities and occasions. As it should be, in Palestine it does not really matter what the differences are as every one is Palestinian in the end, and thankfully everyone is there to celebrate it today. And while all Ramadan traditions here are ones shared with all other people in various Muslim communities, this is the one very unique feature of Ramadan in Palestine.